Internet Archaeol. 25. Williams. Aerial photographs. The only coverage of vertical aerial photographs (APs) we have been able to discover for the study area dates to the 1970s. Unfortunately, no negatives can be located, and the surviving twenty prints are damaged, have no registration, do not provide a complete coverage (or stereoscopic pairs) and have differential exposures. Nevertheless, the images clearly demonstrate the potential of such an approach, with good definition of buildings, streets and canals (Fig. 12), although nothing on the scale of the clarity of the material from Samarra, which had a shorter period of use (Northedge 2005). 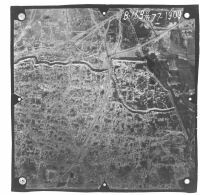 Figure 12: One of the Russian 1970s vertical air photographs, covering the north central part of the city of Sultan Kala, with the citadel (Shahriyar Ark) clearly visible in the upper right, and the Madjan Canal winding its way northward (top) through the centre of the image. We have only managed to uncover a set of prints for these photographs: Note earlier annotations. There are currently problems with collecting new material: partly a lack of suitable aircraft in the region, but mainly the sensitivity of the area, especially as it is not far from a military airfield at Mary. As yet, we have been unable to secure permissions for new flights, although we hope that this may change in the future. In addition, there is a lack of accurate maps for the region. The best were a series of 1:10,000 maps published by the Soviets in 1954 (Fig. 13), but these are very variable in terms of accuracy, with contours/slopes sometimes running in the wrong direction and some features poorly located. They were probably constructed from APs, now sadly lost, but possibly without any group truthing/checking. These maps were explored as a possible base for geo-referencing the vertical APs, but the lack of fit, coupled with the quality of the APs themselves, made this very problematic. The decision, therefore, was to acquire a new high-resolution satellite image, to act not only as a base map for future survey work but also to provide a frame of reference against which to attempt the rectification of the aerial photographs.